Click to view the analysis. 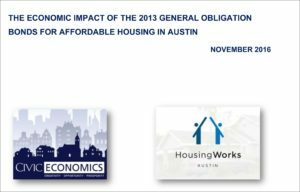 In celebration of the 10th anniversary of Austin’s general obligation affordable housing bonds, HousingWorks commissioned Civic Economics to complete an economic analysis of the bonds. To date, approximately one-third of the 2013 housing bonds have been obligated ($27 million out of $65 million). These funds have been invested in both new construction and acquisition rehabilitation, resulting in nearly 1,300 units of affordable housing. Click below to watch a Keep Austin Affordable video feature that includes highlights from the analysis and commentary from three people who are using the bonds to transform lives. The city’s $27 million investment was leveraged with an additional $190 million in outside funding. That’s a 7:1 leverage ratio! · The housing bonds have had a significant construction impact, employing more than 2,300 workers. · The city’s $27 million investment will result in 1,278 units of rental housing created or preserved, 713 of which are deeply affordable. · Affordable housing created by the housing bonds will have ongoing operational impacts, estimated to be $180 million over 10 years. · Assuming the remaining bonds are invested and leveraged in a similar manner, we can expect a local economic impact of more than $900 million during construction alone.